Purpose: Wedge rolling mill lines of the following dimension-types LSKP 15×250, LSKP 520×50 are designed for production of stepped shafts by cross-wedge rolling. Purpose: Reinforced helical rolling mills of the following dimension-types SPV 30-34 are intended for shaping of profile of special sharp thread on reinforced screws and drill rods by hot helical rolling. Purpose: LPTV 30-70 short Rotary Bodies Rolling Lines are designed for production of rotary bodies from steel and non-ferrous metal by helical rolling. Purpose: SPTZ 60-420 Sprockets Rolling and Thermal Treatment Mills are designed for hot rolling of chain wheels teeth. 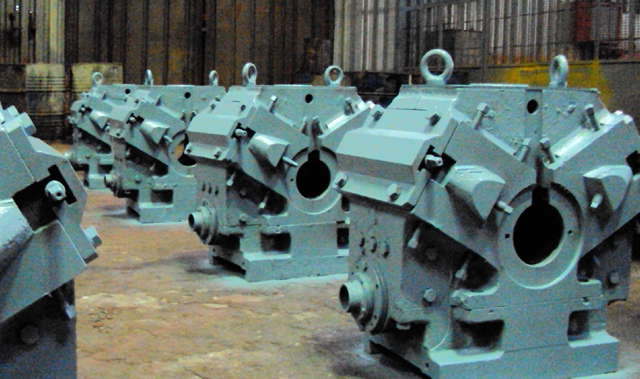 Transport loading, feeding and working roller tables with unit and eccentric drive of wide-strip and section mills. Purpose: Roller tables are used to move metal to the rolling mill, feeding of metal to rollers, receipt it from the rollers and transfer to auxiliary machines (shears, saws, straightening machines and etc.). - Run-out roller tables of wide-strip hot rolling mills. - Roller tables above the coilers of wide-strip hot rolling mills. - Spreading roller tables of work stands of slabbing mill, bloomings. - Furnace roller tables rollers. - Mechanical and hydraulic guide bars before wide-strip rolling mills’ stands.